Iran’s military has 545,000 active personnel and some of the most advanced military technology of anyone out there. The thing is, the United States gave them a lot of it. Granted, it wasn’t the modern Iran that we stocked up with some of the hottest tech of the time, but the pre-revolutionary country that, at one point, was a key ally of the United States in the Middle East. Still, Iran has developed their own military industrial complex to develop, maintain, and upgrade military resources. And they’ve gotten pretty good at it. So ignoring their possible but unconfirmed nuclear program, we run down all the military toys that we found the Iranians are playing with. Decades of United Nations embargo and a bunch of advanced Soviet and American tech laying around meant that Iran got busy, designing original weapons systems. We’ll take a look at that stuff for the first time here. United States sold 202 of these helicopters to Iran from 1975-1978. As of right now, only around fifty remain in service. Iran used the helicopters with disputed success in the Iran-Iraq War. The AH-1W, a similar aircraft, remains a cornerstone of the U.S. Marine Corps’ attack helicopter fleet. The attack helicopter carries a crew of two, a max speed of 219 mph, and a service ceiling of 10,500 feet. It’s 53 feet long. Iran has also built an upgrade the Panha 2091, from AH-1J aircraft. Their efficacy is unknown. A naval missile system designed by the United States and exported to multiple nations, these rockets pack a punch. Entering into service in 1967 and made by Raytheon, this guided missile system can travel at three-and-a-half times the speed of sound and have an operational range of up to 90 nautical miles. The rockets are 15 feet long. The Iran Navy has these installed on a number of missile boats and frigates. This one is unconfirmed, but Iran claims that they have them and the sources are plausible. And if they do have the S-300, that’s a pretty big deal. Iran claimed they had inked a contract with Russia on some of the systems, which the Russians categorically deny. They may have gotten some from Gaddafi. They may have scored some from Croatia or Belarus, or some parts from Russia. 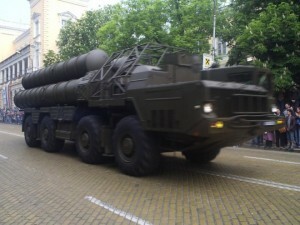 They have made the Bavar 373 system, which Iran claims has the same capabilities as the S-300. Still, this system would be quite a get. NATO called it the S-10 Gladiator. The Soviets developed in the 1970s, and it’s been continually upgraded until the cessation of production in 2011. It’s one of the most potent anti-aircraft missile systems in the field today. There are even variations that have been designed to intercept ballistic missiles. The radar system can track 100 targets at once, and can simultaneously engage 12 of them. The 23 foot missiles used weigh two tons and have a range of between 56 and 93 miles. They travel at six times the speed of sound. The missile system has never been used in combat as yet, but NATO has trained for that eventuality. This anti-tank missile is one part on the long, tumultuous history of U.S.-Iranian relations. Manufactured by Raytheon and entering service in 1970, this anti-tank missile has an operational range of up to 3,750 meters. The TOW missiles were also used by American forces in the 2003 assault that killed Uday and Qusay, Sadaam Hussein’s sons. Iran got them from the United States in a deal that would later cause the Iran-Contra affair, where the United States facilitated the sale of the TOW missiles to Iran in an attempt to recover hostages, then used the proceeds to fund the Contras in Nicaragua. From 1986-1986, the United States supplied Iran with over 2,000 TOW missiles. Even more disconcerting: Iran has completely reverse engineered the TOW system to develop their Toophan anti-tank missile, reportedly used by Hezbollah in the 2006 Lebanon War. Iran has put a lot of effort into developing domestically manufactured tech. The Zufiqar tank is one great example of what they’ve accomplished so far. Named after the legendary sword of the Prophet Muhammad’s son-in-law, the Zufiqar is a 41 ton, 23-ft long battle tank manufactured in Iran by the Shahid Kolah Dooz Industrial Complex. It’s armed with a 12.5 cm tank gun, and carries two machine guns. It can go up to 43mph. The United States knows that Iran has acquired the F-14 Tomcat. After all, we did sell it to them. The Islamic Republic of Iran Air Force has two squadrons of F-14s, acquired during the period before the Shah of Iran was deposed during the Islamic Revolution. The F-14A, the variant that Iran has, first flew in December, 1970. We sent later sent 79 of the fighter jets to Iran. 59 remain in service, maintained thanks to reverse engineering. The interceptor was designed to counter maneuverable fighter jets, as well as cruise missiles and bombers. The Iranian Navy is in possession of multiple operational submarines acquired form the Soviets. They posses three Kilo-class subs, which can dive to a depth of up to 300 meters and can travel for up to 45 days without restocking. 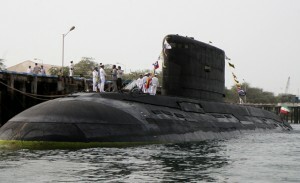 Kilo-class subs are diesel-electric powered, and are around 70 meters long. What’s particularly interesting about Iran’s subs is that their Navy has proved themselves capable of maintaining and repairing the vessels independent of other nations. Earlier this year, it came out that Iran had decided against sending their subs to a Russian dry dock for repairs because of fears that they would lose the ships in some way. Instead, Iran’s homegrown defense industry carried out a series of complex repairs, renovations and replacements to make the subs seaworthy again. These subs are a crucial aspect of Iran’s strategy to maintain control of the Strait of Hormuz. For Iran, the name of the game is maintaining and upgrading military supplies from decades ago to remain operable in the modern age. With the MiG-29, that’s not exactly hard. The MiG-29 remains in use in the Russian Air Force. More than 1,600 have been built. It has a max speed of Mach 2.25 and a range of nearly 900 miles. It has a 30mm cannon and can hold up almost four tons of armaments. This includes up to six air-to-air missiles. It was intended to compete with the General Dynamics F-16. Iran has 25 MiG-29s in service at this point. This one could be big, as it means that Iran is in line with the rest of the world after contracting drone-fever. This combat drone was unveiled in late 2010, and details are still sketchy. The State television network has claimed that Karrar — meaning “Striker” — has a range of 620 miles and can deliver two quarter-ton precision-guided bombs. It can travel 560 miles per hour, allegedly. Possibly one of Iran’s best weapons remains their immensely strategic location. Their coastline comprises one side of the Strait of Hormuz, one of the most tactically significant stretches of water in the world. 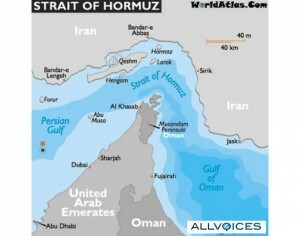 The Strait of Hormuz connects the Persian Gulf with the Arabian Sea, then the Indian Ocean, then the rest of the world. One third of all the world’s oil is moved through the strait. Were Iran to cause a disruption in the Strait — perhaps by mining it, something they have the complete ability to do — it would have catastrophic effects on the global price of oil, and could bring the global economy to its knees. Does the U.S. Navy have mine detection systems? Obviously. Does your average oil tanker? Essentially, one of the biggest threats doesn’t come from their missile systems, or their “will-they-or-won’t-they” nuclear program, or any of the jets. Iran can’t win that way, and they know it. But interrupting service in a strait that they could feasibly dominate? That could be a winning end game for Iran. That’s what you should be afraid of. Readers should note that the above is only a partial listing of the weapons Iran has at its disposal. Some are still under development and will only enter service in the next year or so, like the Bavar 373. Developed to replace the S-300 after the agreed sale with Russia fell through following U.S. and Israeli pressure, the Bavar 373 is reportedly even more capable than the S-300. This is more than idle boasting on Iran’s part however. Judging from the Bavar 373’s transport, which was displayed during a parade in Tehran last month, the system has the potential to be a real ‘game-changer’. The above article also fails to mention Iran’s formidable and growing arsenal of surface-to-surface medium range missiles. In addition to its indigenously developed short and medium range anti-aircraft missile systems, like the Raad, pictured left and featured on video here. Make no mistake, the Raad is a formidable air defence system on par with anything in the West and Russia too. Also omitted is Iran’s Ababil-T attack drone with a range of 2,000 kilometres, or its growing and largely home-developed naval capability. The West is trying to play down Iran’s burgeoning military ability, just as the Western media once trumpeted Iraq’s mythical Weapons of Mass Destruction. However Iran is not Iraq, it is far more capable and none of this even takes into account the likelihood that should military conflict erupt Russia and China would intervene alongside the Islamic Republic. All this means that the West will be making a HUGE mistake if it decides to confront Iran militarily. Iran is developing into a power of some magnitude both militarily and regionally, while the U.S., although still a global power is a nation in decline. Right now taking on Iran is beyond Israel’s ability to deal with militarily if it acts alone. Soon it will be beyond America’s capability too. It isn’t yet but in only a few short years it will be.